In the Dolls House part 4 'Men of Good Fortune', in the Nineteenth Century Hob Gadling refers to 2 other people who cannot die. One of these is Mad Hettie, (I am assuming), a fictional character that Neil Gaiman uses many times throughout the "The Sandman" story arc, however the other Hob refers to only as 'Blood'. Assuming that this is some other historical or literary reference, does anyone know who this refers to? This appears to be a (DC) reference to Jason Blood. Jason Blood is a world leading expert on the occult and demonology. He has walked the Earth since the 6th Century, after the wizard Merlin bound the increasingly uncontrollable threat of Etrigan The Demon to his mortal soul. 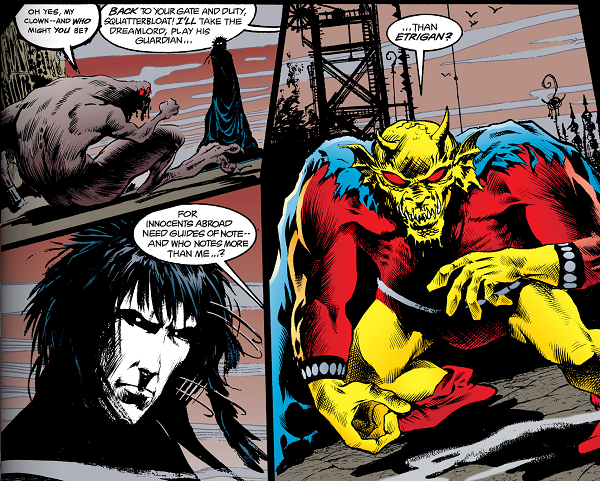 We met his host (the demon Etrigan) a few issues earlier in Sandman: Master of Dreams - A Hope in Hell but to the best of my knowledge we never meet Jason. Not the answer you're looking for? Browse other questions tagged comics vertigo-comics the-sandman or ask your own question. Which Sandman issue(s) has the man who cannot die? Who is the white sleeper in Fairest #1?